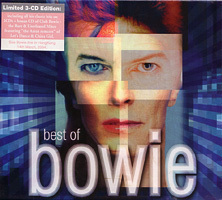 Best of Bowie was released in 20 editions in 22 different countries. Each version can be identified by the flag of the country of origin on the spine, except for the Argentinean/Mexican, Eastern European and UK editions, which are "flag-less". Also see Pirates for several Southeast Asian editions. No less than 63 songs are included on Best Of Bowie if all editions are considered; see the Best Of Bowie song checklist for the different edits and versions used. (EMI 7243 5 41916 2 6), November 2002 (Argentina/Mexico). Space Oddity/The Man Who Sold The World/Changes/Ziggy Stardust/Young Americans/Fame/"Heroes"/Under Pressure/Ashes To Ashes/Let's Dance/China Girl/Modern Love/Blue Jean/This Is Not America/Dancing In The Street/Jump They Say/Hallo Spaceboy/Little Wonder/Thursday's Child/Slow Burn. Both editions share the same catalogue number. Originally scheduled for Mexico only but released in Argentina just a few weeks later. For unknown reason both editions are 'flagless'. 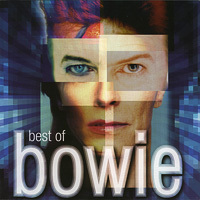 See the Best Of Bowie song checklist for the versions used on this and all other editions. (EMI 7243 5 42075 2 5), October 2002 (Australia). Space Oddity/Changes/Starman/Ziggy Stardust/The Jean Genie/Sorrow/1984/Young Americans/"Heroes"/Ashes To Ashes/Fashion/Under Pressure/Let's Dance/China Girl/Modern Love/Blue Jean/Fame 90/Dancing In The Street/Slow Burn. (EMI 7243 5 41898 2 1), November 2002 (Belgium). Let's Dance/Fame/Fashion/This Is Not America/Space Oddity/Ziggy Stardust/The Jean Genie/Golden Years/Absolute Beginners/Ashes To Ashes/Changes/Rebel Rebel/"Heroes"/Young Americans/Under Pressure/Tonight/China Girl/Blue Jean/Dancing In The Street/Slow Burn. 'Tonight' is listed as the live version with Tina Turner on the cover and in the booklet but the CD plays the studio version. (EMI 7243 5 41899 2 0), November 2002 (Brazil). Space Oddity/Changes/Life On Mars/Starman/Ziggy Stardust/John, I'm Only Dancing/The Jean Genie/Rebel Rebel/Young Americans/Fame/Golden Years/Sound And Vision/"Heroes"/Ashes To Ashes/Fashion/Under Pressure/Let's Dance/China Girl/Thursday's Child. (EMI 7243 5 419828 4 5), November 2002 (Bulgaria/Hungary/Slovenia/Turkey/Ukraine). Space Oddity/The Man Who Sold The World/Changes/Starman/Ziggy Stardust/Suffragette City/Young Americans/Fame/Wild Is The Wind/Golden Years/Heroes/Boys Keep Swinging/Under Pressure/Ashes To Ashes/Let's Dance/China Girl/Modern Love/Dancing In The Street/Hallo Spaceboy. Cassette only. All tracks are album versions except 'Hallo Spaceboy' (Pet Shop Boys Remix). (EMI 7243 5 42242 2 5), November 2002 (Canada). Space Oddity/Changes/Suffragette City/Ziggy Stardust/The Jean Genie/Rebel Rebel/Young Americans/Fame/Golden Years/"Heroes"/Ashes To Ashes/Fashion/Under Pressure/Let's Dance/China Girl/Modern Love/Blue Jean/Dancing In The Street/This Is Not America/I'm Afraid Of Americans. Track listing identical to the US edition, which see for further info. (EMI 7243 5 42244 2 3), November 2002 (Canada). Space Oddity/The Man Who Sold The World/Changes/Life On Mars/Moonage Daydream/Suffragette City/Ziggy Stardust/All The Young Dudes/The Jean Genie/Panic In Detroit/Rebel Rebel/Diamond Dogs/Young Americans/Fame/Golden Years/TVC15/Sound & Vision/"Heroes"/DJ/Ashes To Ashes/Fashion/Scary Monsters/Under Pressure/Cat People/Let's Dance/China Girl/Modern Love/Blue Jean/This Is Not America/Dancing In the Street/Absolute Beginners/Time Will Crawl/Under The God/Jump They Say/The Heart's Filthy Lesson/I'm Afraid Of Americans/Thursday's Child/Slow Burn. (EMI 7243 5 42383 2 1), November 2002 (Chile). Space Oddity/The Man Who Sold The World/Changes/Life On Mars/Starman/Ziggy Stardust/John, I'm Only Dancing/All The Young Dudes/The Jean Genie/Sorrow/Rebel Rebel/Young Americans/Fame/Golden Years/Wild Is The Wind/Sound And Vision/"Heroes"/Ashes To Ashes/Fashion/Under Pressure/Cat People/Let's Dance/China Girl/Modern Love/Blue Jean/Tonight/This Is Not America/Dancing In the Street/Absolute Beginners/Underground /When The Wind Blows/Day-In Day-Out/Never Let Me Down/Hallo Spaceboy /Little Wonder/I'm Afraid Of Americans/Thursday's Child/Slow Burn. This edition is unique in having the US single edition of 'Rebel Rebel'. (EMI 7243541900-2), January 2003 (Columbia/Venezuela/Ecuador/Peru). The Man Who Sold The World/Changes/Life On Mars/Starman/Young Americans/Fame/"Heroes"/Under Pressure/Ashes To Ashes/Let's Dance/China Girl/Modern Love/Blue Jean/This Is Not America/Never Let Me Down/Dancing In The Street/Fame 90/Hallo Spaceboy/Little Wonder/Slow Burn. Note that this edition has the original version of 'Fame' as well as the 1990 Gass Mix! (EMI 7243 5 41918 2 4), November 2002 (Denmark). Let's Dance/Rebel Rebel/This Is Not America/Dancing In the Street/Fame/The Jean Genie/Jump They Say/"Heroes"/Fashion/Changes/TVC15/China Girl/Absolute Beginners/Thursday's Child/Ziggy Stardust/Ashes To Ashes/Drive-In Saturday/Space Oddity /DISC TWO /Young Americans/Slow Burn/Life On Mars/Under Pressure/Hallo Spaceboy/Sorrow/Blue Jean/Sound And Vision/Little Wonder/Starman/Boys Keep Swinging/Loving The Alien/Golden Years/John, I'm Only Dancing/Day-In Day-Out/Modern Love/Black Tie White Noise/Cat People/Rock 'N' Roll Suicide. (EMI 7243 5 41901 2 4), October 2002 (France). Space Oddity/The Man Who Sold The World/Changes/Life On Mars/Starman/Ziggy Stardust/The Jean Genie/Rebel Rebel/Young Americans/Fame/"Heroes"/Under Pressure/Let's Dance/China Girl/This Is Not America/Absolute Beginners/Hallo Spaceboy/Little Wonder/Thursday's Child. (EMI 7243 5 41912 2 0), November 2002 (Germany/Switzerland/Austria). Let's Dance/Ashes To Ashes/Helden/Fame 90/Young Americans/Fashion/Ziggy Stardust/Space Oddity/When The Wind Blows/Cat People/Sound And Vision/Loving The Alien/Blue Jean/China Girl/Under Pressure/Dancing In The Street/Absolute Beginners/This Is Not America/Thursday's Child/Slow Burn. Contrary to the separate Swedish/Norwegian editions, this is a single edition for Germany/Switzerland/Austria together. (EMI 7243 5 41921 2 8), November 2002 (Greece). Space Oddity/The Man Who Sold The World/Oh! You Pretty Things/Changes/Life On Mars/Starman/Ziggy Stardust/Suffragette City/John, I'm Only Dancing/The Jean Genie/Drive-In Saturday/Sorrow/Diamond Dogs/Rebel Rebel/Young Americans/Fame/Wild Is The Wind/Golden Years/TVC15/Sound And Vision/"Heroes"/Boys Keep Swinging/Under Pressure/Ashes To Ashes/Fashion/Scary Monsters/Let's Dance/China Girl/Modern Love/Blue Jean/This Is Not America/Loving The Alien/Dancing In The Street/Absolute Beginners/Cat People/Hallo Spaceboy/Little Wonder/I'm Afraid Of Americans/Slow Burn. (EMI 7243 5 41915 2 7), November 2002 (Italy). Space Oddity/Changes/Life On Mars/Starman/Ziggy Stardust/Rebel Rebel/Young Americans/Fame/"Heroes"/Under Pressure/Ashes To Ashes/Fashion/Let's Dance/China Girl/Modern Love/This Is Not America/Absolute Beginners/Little Wonder/Slow Burn. (Toshiba/EMI TOCP-67061), October 2002 (Japan). Space Oddity/Changes/Life On Mars/Starman/Lady Stardust/Ziggy Stardust/The Jean Genie/Rebel Rebel/Young Americans/Fame/Golden Years/"Heroes"/Ashes To Ashes/Fashion/Under Pressure/Let's Dance/China Girl/Modern Love/Dancing In The Street/Slow Burn. There also is an EC-printed Japanese edition (EMI 7243 5 41924 2 5). The Thai edition is identical to the latter. Also available in Thailand as a cassette (EMI 7243 5 41924 4 9); note the different cover compared to the Eastern European release. (EMI 7243 5 41914 2 8), October 2002 (Netherlands). Let's Dance/Under Pressure/The Jean Genie/China Girl/Space Oddity/This Is Not America/Blue Jean/Dancing In The Street/Sound And Vision/Tonight (live)/"Heroes"/Ashes To Ashes/Golden Years/Absolute Beginners/Rebel Rebel/Fame/Fashion/Modern Love/Boys Keep Swinging. (EMI 7243 5 41925 2 4), November 2002 (New Zealand). Space Oddity/The Man Who Sold The World/Oh! You Pretty Things/Changes/Life On Mars/Starman/Ziggy Stardust/Suffragette City/John, I'm Only Dancing/The Jean Genie/Sorrow/Diamond Dogs/Rebel Rebel/1984/Young Americans/Fame/Golden Years/Sound And Vision/Heroes/Under Pressure/Ashes To Ashes/Fashion/Cat People/Let's Dance/China Girl/Modern Love/Blue Jean/Tonight/This Is Not America/Dancing In the Street/Absolute Beginners/Underground/Magic Dance/Day-In Day-Out/Jump They Say/Hallo Spaceboy/Little Wonder/Thursday's Child/Slow Burn. The first appearance of the edits of 'Underground' and 'Magic Dance'. Contrary to other editions, this one has the album version of 'Young Americans' rather than the US single edit. (EMI 7243 5 42346 2 0), October 2002 (Norway). Space Oddity/Life On Mars/Changes/Starman/Ziggy Stardust/The Jean Genie/Rebel Rebel/Young Americans/Fame/Golden Years/"Heroes"/Ashes To Ashes/Fashion/Cat People/Let's Dance/China Girl/Blue Jean/This Is Not America/Absolute Beginners. The Swedish edition has catalogue number EMI 7243 5 41917 2 5. (EMI/Gala 50999 5184182 9), 2007 (Russia). Official Russian edition. The track listing is identical to the US edition. (EMI CDEMCJ (WF) 6033), October 2002 (South Africa). Let's Dance/China Girl/Absolute Beginners/Under Pressure/Sorrow/Space Oddity/The Jean Genie/This Is Not America/Dancing In The Street/Ziggy Stardust/Blue Jean/Ashes To Ashes/Starman/Fame/"Heroes"/Fashion/Changes/Loving The Alien/Modern Love. (EMI 7243 5 41917 2 5), October 2002 (Sweden). Track listing identical to the Norwegian edition. (EMI 7243 5 39821 2 6), November 2002 (UK/EC). Space Oddity/The Man Who Sold The World/Oh! You Pretty Things/Changes/Life On Mars/Starman/Ziggy Stardust/Suffragette City/John, I'm Only Dancing/The Jean Genie/Drive-In Saturday/Sorrow/Diamond Dogs/Rebel Rebel/Young Americans/Fame/Golden Years/TVC15/Wild Is The Wind/Sound And Vision/"Heroes"/Boys Keep Swinging/Under Pressure/Ashes To Ashes/Fashion/Scary Monsters/Let's Dance/China Girl/Modern Love/Blue Jean/This Is Not America/Loving The Alien/Dancing In the Street/Absolute Beginners/Jump They Say/Hallo Spaceboy/Little Wonder/I'm Afraid Of Americans/Slow Burn. This 2CD was commonly released in countries that didn't have their own edition. There are also Hong Kong and Australian pressings of this edition. 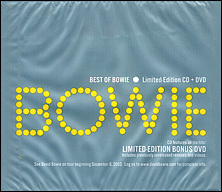 Special Asian tour editions from Hong Kong and Singapore (EMI 7243 5 77949 2 3; second and third) came in a slipcase and included Club Bowie as a bonus CD. 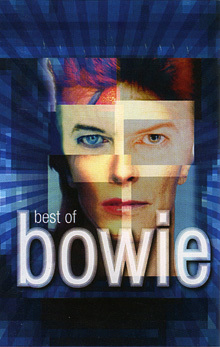 Released as a bundle shrinkwrapped with the Best Of Bowie 2DVD (EMI 7243 5 54906 0 5) in 2004 through the Insight Music website and by a UK phone line only. 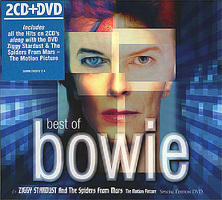 The last variation was issued November 2008 as a "Gift Pack", a digipack edition (EMI 50999 2429122 4; bottom) in a custom wrapper including the Ziggy Stardust - The Motion Picture DVD. Oddly enough for a European release, the latter is in regio 1 NTSC format. (Virgin/EMI 7243 5 41929 2 0), November 2002 (US). 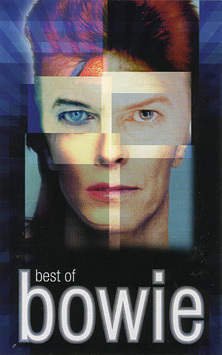 Bonus DVD of the 2003 US reissue includes: Let's Dance (Club Bolly Mix Video)/David Guetta vs. Bowie: Just For One Day (Heroes) (Video)/Black Tie White Noise (Live At Hollywood Center Studios)/Let's Dance (Club Bolly Extended Mix)/Let's Dance (Bollyclub Mix)/China Girl (Club Mix)/David Guetta vs. Bowie: Just For One Day (Heroes) (Extended Mix)/Loving The Alien (Scumfrog Remix)/Nite Flights (Moodswings Back To Basics Remix). 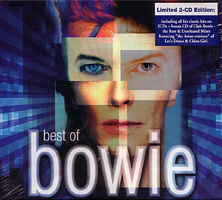 Also see the 2CD edition below and the Best Of Bowie song checklist for the versions used. In 2003, the US 1CD edition was reissued with a bonus DVD, sealed in a custom wrapper (Virgin/EMI 72435-95692-0-8; bottom). The third track on the bonus DVD has been taken from the Black Tie White Noise video. (Virgin/EMI 7243 5 41930 2 6), November 2002 (US). Contrary to other editions, the single edit of 'TVC 15' and the album version of 'Modern Love' are included.